"The Spycam" — see and hear what you want, and maybe in places you shouldn’t, with live color picture and sound transmission to your TV. 2.4 GHz, 4-channel. Range 150′. "The Claw" — build it to pick up a soda can, or a feather. Mount it horizontal or vertical to grab what you want. Great for terrorizing your pets! 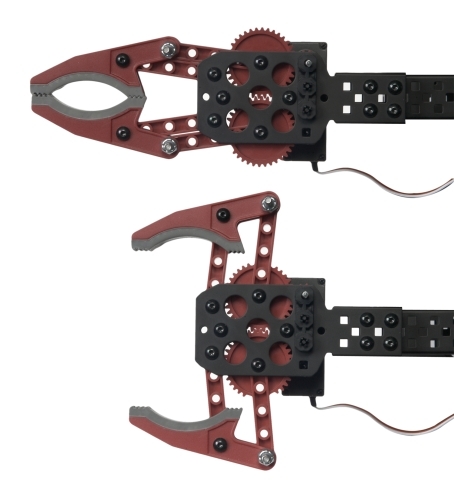 "The Arm" — servo motors let you manipulate the action to reach high, low, and in-between. 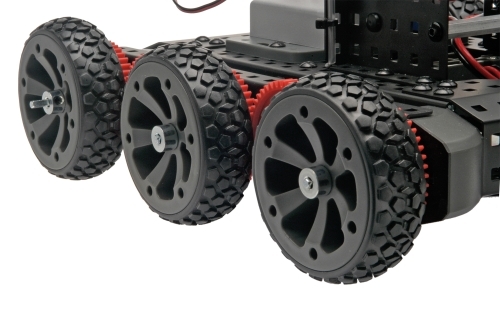 All Terrain Tires — Go anywhere, inside or outside, with six heavy-duty, gear-driven wheels. 6-channel hobby-class transmitter — 4 analog and 2 digital channels offer maximum flexibility to control servos and provide exceptional stability to avoid frequency drift. VEXplorer will be compatible with the older VEX hardware, so if you have a bunch of sensors and servos and whatnot lying around from the previous generation, don’t sweat it. VEXplorer kits are currently available for pre-order, and will begin shipping at the end of August. Now you’re ready for action! Have you been waiting for the perfect opportunity to jump on humanoid robot bandwagon? Well, the time has come! 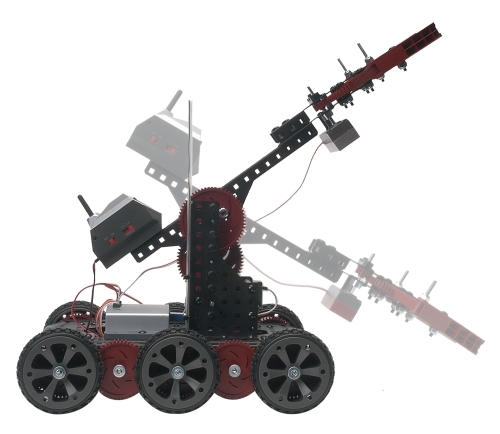 Trossen Robotics is now offering a KHR-2HV starter kit. The kit includes everything you see in the picture above: the stock KHR-2HV kit, plus an 800 mAh battery (quite an improvement over the stock 300 mAh battery), a KRG-3 gyro sensor, and the KRC-1 remote kit (which, for a limited time only, includes a USB dongle so you can control your robot from the remote or from your computer!). With this kit, you get the gear you need, plus you save money! Everybody likes saving money. If you’re still reading this, it means that you aren’t looking at the KHR-2HV starter kit yet. Go! New IR Distance Sensor Kits! 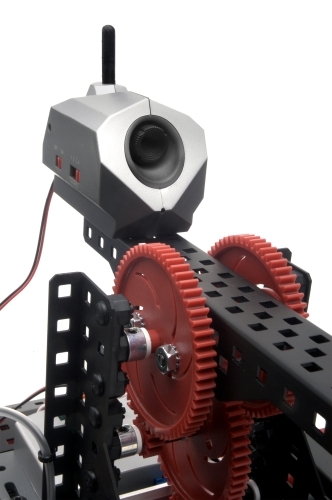 Add a layer of spatial awareness to your next PC-based robot! We started offering these kits because we wanted to show you how easy it is to set up an IR distance sensor array using the Phidgets 8/8/8. The kits come with either 4 or 8 Sharp GP2D12 IR distance sensors. These sensors can measure distances from 4 to 30 inches. If you want better close-range sensing, no problem! When you place your order, just state in the comment section that you want GP2D120 sensors instead. GP2D120’s will measure distances ranging from about 1.5 to 12 inches. It’s kind of like an infrared octopus. Hey look, we have videos! Dave appears in the most videos because he has the least dignity! If you were at Maker Faire 2007, you may have already seen this kit in action. This interactive display, controlled by our USB IR sensor kit, was a big hit with the kids. Follow this link to check out the 4-sensor kit! 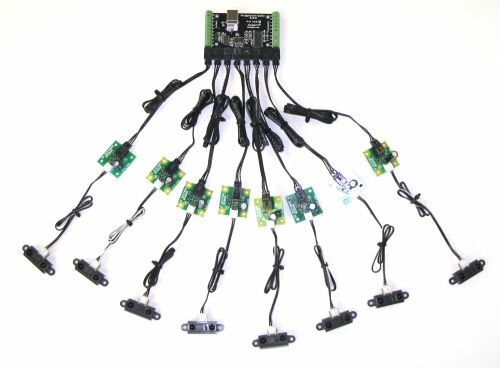 Follow this link to check out the 8-sensor kit!